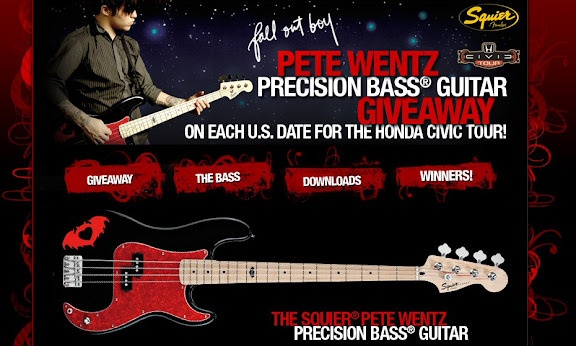 Another clue for Frame 6 and the plot thickens, this guitar is not from a Blink 182 band member but from the bass player of Fallout Boy who are also playing with Blink 182 this summer. They are both playing at the Superpages.com center in Dallas on the 23rd of September. 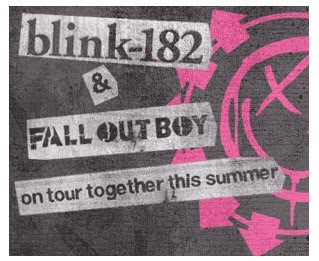 This image is from the Fallout Boy website and includes the pink X.
Pete Wentz and his guitar. 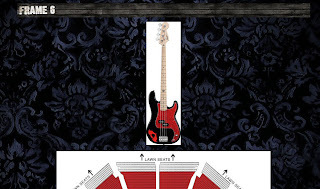 Thanks to Amy Lynn for the first news about the new clue, skarphedin for the information about the guitar's owner and LotteryTicket for the pointer to the pink X image. Really. Apparently, Wentz has had a bad viral marketing experience. But a red herring? I'm glad the clues are getting easier. I tweeted Mr. Wentz. Let's see if he replies. unlocke at Dark's forum posted this. See you in another life brother(s)!!! So I googled it and came up with this. By the time I post this I'll probably have to move it to the new post. :) LOL yep just got the tweet. Had to do it twice. The link was broken the first time for some reason. A ha, I see a link now. The symbol on the guitar is also featured on the Clandestine Industries web site that is run my none other than out poster selling buddies. Zort - Good find on the Clandestine Industries. Apperently their flagship store is in Chicago (as Wentz is from Chicago). The clues up until now have pointed toward a Dallas event on the 23rd at the concert, but they still have two days of clues to give us, and maybe they are now going to steer us to a Chicago event? I would certainly welcome that! skarphedin - I think the original clue (lone star) and the seating plan for the Superpages center pretty much seals the deal on Dallas. Did we reconcile the source for number 5744990301074506? just a google image search located this. Just think this image used by Tyson, not meaning to direct us to Citra Intirama, Jakarta, Indonesia. Lottery, yeah I pointed to that in the last comment block. Zort is right about Clandestine studios. I was wondering how long it would be before Fall out boy entered the picture. "Clandestine Industries was conceived in 2004 by Fall Out Boy bassist Pete Wentz, utilizing the moniker to publish his first fictional book, "The Boy With A Thorn In His Side." Inspired by the nightmares of a young Pete Wentz, the book's success inspired him to expand his creative vision into a clothing line, which would draw influence from all of Pete's pop culture influences and experiences. Since its initial inception, Clandestine Industries has blossomed into a full-fledged lifestyle brand focusing on producing limited-edition tees, hoodies, and accessories (establishing the line's iconic Batheart logo), while working with companies and brands such as DKNY Jeans, Wet Seal and Nordstrom. In 2007, Clandestine Industries Landmark retail store opened in Pete's hometown of Chicago, helping further the brand's journey and creating a space for fans of the clothing line to commiserate and purchase limited store-only exclusives. In February 2009, Clandestine Industries relaunched its website (starting over from scratch) and debuted a new collection entitled, "Don't Call It A Comeback," and immediately sold out of items only an hour after the release. The line is currently sold online only at clandestineindustries.com and at our Chicago Landmark location." So, come Wendsday, are they going to reveal the URL mid-concert? the logo (as stated above) is called the "batheart"
Has ANYONE figured out impatientashell.com? Anyone? Cause I don't think it's solvable. I see this in the source that looks odd. "meta name="description" content="fl md convo mkj""
and this in the text. I am guessing the username is "Frank"
and the rest gives the password. Something to do while we wait for the last clue I suppose. Zort, i went for the hoodie king thing. I see that thecobraman is tweeting from the shows. Is it possible that this will be a url twitter? Registration for LU tomorrow. Anyone get an e-mail reminder? yeah. i got all that the md convo stuff. B16(20) . . . i'll busily cook while waiting for reply, 'just a gentle push' will do. I am gonna go with base 16 (or hex) based on the "3f". Sorry working on toddler night night time. back in a few hours and maybe I can crack what it is after my focus is not night night time. Does anyone know if the LU site is going to live at midnight? Mystery over. Guess it's just a question of whether they will reveal the new website OUTSIDE or INSIDE the venue. I'm leaning towards outside. "No Purchase Necessary"....is a huge legal disclaimer that I'm sure the Dizney Legal suits would have insisted upon for any of these events. voice mail message on 818-824-6300 changed. I'd think that it should be outside too Cheif, they said that we wouldn't really have to go anywhere to experience the fun, and paying is definitely beyond the call of going somewhere! I told him and it turns out, Captain loves being compared to the hypnotoad! I just signed up, printed a card, and took the test for Lost University! LOL, I placed out of Lost 101. Anybody else go there yet? Yep, Black Swan, we're classmates! LOL I also tested out of Lost 101! Got my card printed, too! Classes don't start until Dec. 8th! Luckily, I have Blu-Ray! I'm sure these special areas will be all over our sites for those that don't! Hi, maven! I think you're right and the content will end up being available online. So, nothing other than waiting for Dec. 8 and maybe buying one of those Lost University t-shirts for 14.95 at the moment, right? I'm enrolled. However, even answering ALL questions correct (only hesitated on the chicken, I received 21/23. Boooooo. Lost 101 is fried with everyone tried to watch. Think the last clue is about to drop? Almost midnight. Yes, BS...I'm gonna get that Freshman T-shirt for the Class of 2010! Lottey Tickey, just out of curiosity did they say you tested out of the first class? I know.. that Lost 101 video may as well wait until tomorrow. They say the shirt is sold out too, but I think it just isn't available yet? Yes. Something like that. But still required to watch 101 video. But the way, what I did see before it locked up, was interesting. Description of Locke and scenes I don't recall from show. Possible outtakes? When's the first dorm party? night all. clue will now magically appear. Can't believe it's been 5 years since that fateful/destiny crash! Happy LOST Day! Thanks, maven. I got 23/23, so I was just wondering where the cutoff was. I know... wow 5 years! What a ride! Hey all! Guess we're all going to be freshman together! I tested out of LOST 101 too. Got my ID card and I'm ready for Dec. 8, yea! Ok, so it's late and I'm trying not to be confused (honestly it was amazing that I passed that entry exam with the way I'm thinking right now)....but when is the Fall Out Boy concert? Wednesday? Happy 5th LOST anniversary everyone! Woo hoo 20 out of 23, I don't need to take Lost 101 !!!! For the Lost University sign up.